The Use of a Modified Cyanoacrylate-based Synthetic Glue in Difficult Laparoscopic Cholecystectomy Cases. INTRODUCTION: Laparoscopy cholecystectomy is the treatment of choice for gallbladder. Unfortunately it is not without complications. The complication rates listed in the literature is low and only increase in the more complex cases or when a less experienced surgeon performs the procedure. Other than the bile duct injuries, the more common complications which are seen include bleeding and bile leakage. In the past, the routine use of drains in laparoscopic cholecystectomy was an accepted practice. However this was associated with increased hospital stay, pain and fever and many surgeons now prefer not to drain or drain only the difficult cases. In the abdomen, the beneficial effects of fibrin sealant have been reported in both experimental and clinical practice. 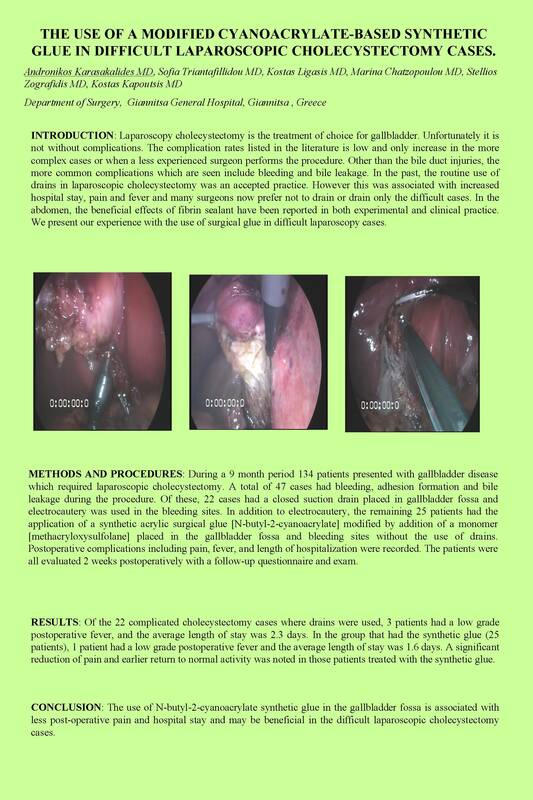 We present our experience with the use of surgical glue in difficult laparoscopy cases. METHODS AND PROCEDURES: During a 9 month period 134 patients presented with gallbladder disease which required laparoscopic cholecystectomy. A total of 47 cases had bleeding, adhesion formation and bile leakage during the procedure. Of these, 22 cases had a closed suction drain placed in gallbladder fossa and electrocautery was used in the bleeding sites. In addition to electrocautery, the remaining 25 patients had the application of a synthetic acrylic surgical glue [N-butyl-2-cyanoacrylate] modified by addition of a monomer [methacryloxysulfolane] placed in the gallbladder fossa and bleeding sites without the use of drains. Postoperative complications including pain, fever, and length of hospitalization were recorded. The patients were all evaluated 2 weeks postoperatively with a follow-up questionnaire and exam. RESULTS: Of the 22 complicated cholecystectomy cases where drains were used, 3 patients had a low grade postoperative fever, and the average length of stay was 2.3 days. In the group that had the synthetic glue (25 patients), 1 patient had a low grade postoperative fever and the average length of stay was 1.6 days. A significant reduction of pain and earlier return to normal activity was noted in those patients treated with the synthetic glue. CONCLUSION: The use of N-butyl-2-cyanoacrylate synthetic glue in the gallbladder fossa is associated with less post-operative pain and hospital stay and may be beneficial in the difficult laparoscopic cholecystectomy cases.